You are viewing all posts published for the month of September, 2010. If you still can't find what you are looking for, try searching using the form at the right upper corner of the page. Niklas Heidloff (blog | twitter) is a developer in the IBM Lotus Domino team and leads IBM’s engagement in OpenNTF. Phiippe Riand (linkedin) is in charge of new technologies within the Lotus Domino offering. He’s the architect for XPages, a brand new Java based technology provided in the Domino server. It helps reinvigorate Domino Web apps by providing a real Web 2.0 development environment, using the latest technologies. Tony McGuckin (linkedin) is a software engineer for IBM, based in Dublin, Ireland. He is one of the authors of the forthcoming “Mastering XPages” book. Paul Withers (blog | twitter | company) leads the Domino Development Team at Intec Systems Ltd, an IBM Business Partner in UK, and fledgling contributor to OpenNTF. Why has it been added to OpenNTF rather than to the product? What version of Notes/Domino is required? Is it for developing for the Web, the client or both? Is IBM offering any support for the library? Can developers extend/edit the library? (From Matt White) How can we include the Extension Library into our templates so that we can distribute NTFs without requiring server change? What if users want new features? What does this mean for XPages as a development environment? Announcement on twitter by LotusEducation of Developing IBM Lotus Domino 8.5.2 Applications: Intermediate XPage Design courses. Lotus Developer Summit announced by Bilal Jaffery and Ed Brill. Only Dolphin and Swan offered as hotels – why? Darren: Domino 8.5.2 supports Windows 2008 R2 – see the 8.5.2 system requirements doc – and what happened to “tech notes”? Niklas: PhoneGap (http://www.phonegap.com/) is an open source project to build mobile apps via web application development techniques and deploy them as ‘native’apps to the various mobile devices. Real enabler for in-context switching! Stuart: WildFire (on OpenNTF) – WildFire is a Lotus Notes 8.5 Sidebar Application to Update Status’s across a wide range of Social Networks including Sametime, Connections, Socialtext, Facebook, GTalk, PingFm, Plurk, Tumblr, Twitter, WordPress and more. Written by Australian BP, ISW. Adam Brown was on the podcast in episode 8. 18: A world without email? Or Blackberries? Bilal Jaffery (blog | twitter) is Worldwide Digital and Competitive Marketing Leader at IBM working on earning influence, not just broadcasting on the web. Jon Mell (blog | twitter) is Head of Consulting at Headshift, a social software consultancy based in London. Do outages/vulnerabilities really cause change? Should IBM be promoting as competitive advantage? Jon: Lotus Connections – refine free text search with tagging. IBM Lotus is offering this technical workshop to help developers like you take advantage of the latest app development technologies. It will provide access to a range of developer focused materials such as technical presentations on our offerings and strategy, lab material with step-by-step tutorials and example code and projects that help fast track a first time developer. Our experts will share some new tips and techniques for building collaborative Web applications. You can learn about the latest application developer advancements that will help extend your skills and expertise associated to designing and deploying world-class applications. This workshop is offered in two formats—classroom and virtual. As of right now, we have 17 worldwide locations reserved. More are in the works..Dubai should be confirmed within the next 48 hours. 17a: Six go mad in Amsterdam! This is a new version of episode 17, republished with improved audio (higher speaker volume, lower noise). Episode 17a, recorded Friday 10th September 2010 live at NLLUG in Amsterdam, discussing user groups, Connections 3.0, Notes 8.5.2, Lotusphere personas and much more. Bill and Paul riding over, an adventure? Suzanne and Mary Beth attended, how were they? Is Belfast a good city to visit? If registered folks can’t make it, what should they do? What are the big new features? Now in the Greenhouse (and on TAP), what should listeners do to try it out? Social SW space is getting ever more competitive – Cisco etc. What is IBM doing to keep Connections and Quickr ahead? Is enterprise social software catching up with the consumer social space, or will there always be a lag between consumer adoption and enterprise adoption? Has it now been fixed? Use the fixed version or wait for the first fix pack? Stuart: It is now relatively easy to theme all pages in Lotus Quickr for Domino. Watch out for blog post this week on The Quickr Blog. Mary Beth: Drag and drop of emails to the desktop in Lotus Notes 8.5.2 – see her blog post. Paul: Don’t share a room with Bill Buchan! Use Internet Password lockout in Lotus Domino. Bill: For admins, use Websphere/IIS plugin to allow AD authentication to Domino websites, see Warren’s post for more details (SM: I also posted on this a while back). For developers, use agent profiling (SM: As an admin, at this point I just heard ‘blah blah blah’, but Bill tells me these links will help!) Normund’s Ls2capi.com site. The ls2capi database download. The View ‘out of office’ API article. 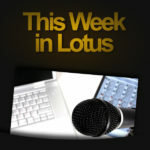 16: Lotus Quickr 8.5 arrives – 200% performance hike, sweet new UI, linux support, is that all? Episode 16, recorded Friday 3rd September 2010, discussing the new release of Lotus Quickr for Domino, issues with SMTP on Domino 8.5.2 and more. Dave Kajmo (email) is the Senior Product Manager for Lotus Quickr at IBM. Rob Novak (blog | twitter | email | company) is President of SNAPPS, an Advanced IBM Partner for 14 years providing products, services, hosting, and business process consulting in the collaboration, enterprise content management, mobilization and business intelligence markets. We’re known for doing Quickr work like customization, support, and templates, although that’s really about 1/4 of what we do – lately we’ve been doing Notes client sidebar apps, working with iPhones and iPads, XPages, the works. Everyone on staff is a 15-20 year Lotus nut. We just did announce our first paid product in seven years (since we tend to give everything else away), some modules for Quickr that really enhance the user experience. Rob has 3.99 business degrees, has spoken at most of the industry conferences and user groups on both technical and business topics, and last but not least we – meaning SNAPPS with the amazing co-producers the Turtles in London – produce Collaboration University. Keith Brooks (blog | twitter keith@vanessabrooks.com www.vanessabrooks.com) – CIO of Vanessa Brooks, Inc. and Director of Services for the SAS Group, an IBM Business Partner for over 10 years based in South Florida. SAS is focused on infrastructure and services, not development, for the IBM pillars of Lotus and Websphere (and a wee bit of DB2). Keith manages the Southeast Lotus User Group and one of the largest Linkedin Groups, Lotus Software Professionals. Prior to being a Business Partner Keith was based in London for Lotus EMEA while working for the Lotus CTO. Tom Tillery (company) is the Vice President of Paraklete Financial, Inc. and serves as the firm’s Chief Compliance Officer. Tom has more than 20 years of experience in financial planning, insurance, investments, philanthropy and tax planning. He has provided these services to businesses, individuals and families of substantial wealth. Paraklete are a Lotus Quickr customer. What are the details of the formal announcement letter? to non-Quickr customers (either with existing Lotus investment, or comparing Quickr and Sharepoint)? What can we replace Entry with? How should customers find out more about Lotus Quickr 8.5? Is it a show stopper? When will there be a proper fix? Should customers hold off upgrading? Stuart: Lotusphere is just round the corner, seriously. If you’re thinking of submitting an abstract, put it together now. If you’re thinking of attending, put together your business case now – flights are pretty cheap at this stage, and you can book the Disney hotels direct (Dolphin, Swan, Yacht Club or Beach Club *) at good rates (particularly with AAA membership). Also, The Quickr Blog. Rob: More of a philosophy suggestion than a tip this time (last time, I gave you a notes.ini entry, so hey I get some leeway). When considering Quickr or an upgrade, or even staying on your current version for while, remember that IBM sells it as a finished product but that there is so much more potential there for return on your investment. Consider your audience and their daily work interactions and activities, and where a self-service, workflow-enabled, integrated solution to simple everyday sharing and process needs could help. Then, read the blogs. Follow the tweets. Read the wikis (usually only the entries referred to in the blogs and tweets though, there’s some stale stuff out there!) Reach out to IBM and its partners and ask the hard questions about what is possible, not just what it “does.”There is so much more in the box than most companies have ever envisioned/envisaged, and I encourage any company who is about to or will continue to use “advanced collaboration”to get damned inquisitive on just how advanced it can be to help their company innovate and grow. Keith: Quickr Blog Post of mine which highlights what is free and available for Quickr D and J. Also iNotes Redirector is your friend, make it fun for everyone to use it or make it more useful. Tom: Use Lotus Quickr! Our practice is virtual and meetings occur either at the customer’s location or at their other advisor’s. Our discussions cover the gamut of disciplines –tax, law, investments and insurance. The volume of material to be reviewed at each meeting is massive and to transport these documents to the meetings presents both a security and logistical nightmare. Prior to each meeting our staff will telephone the customer and insure their ability to access their Quickr site. This enables the most effective use of time with the customer.